All airliners are built to travel from A to B, and divert to an alternative airfield when required, safely. The recent report about the request by Emirates Airlines to aircraft manufacturers for a windowless airliner is intriguing. The argument advanced is that the fuselage becomes safer since there are no joints for windows, the aircraft’s weight reduces, and fuel burn is less due to the reduction in weight. This in turn reduces costs of operation. What is the primary objective of air travel? 1) Safety 2) Passenger comfort 3) system redundancy and 4) Economics. All airliners are built to travel from A to B, and divert to an alternative airfield when required, safely. They are capable of flying to the destination even with loss of an engine. The aircraft systems are designed with back-ups to cater for failures. The crew is trained to identify and operate the systems even when one or many of them fail. The only known fatal accidents due to window failure happened in the 1950s when De Havilland Comets had catastrophic failures of the windows. Ever since they changed the shape from a square to oval, the safety factor has increased and we have had more than 50 years of airliners flying without structural failure of windows. Airliner windows are the only connection a passenger has with nature during a long flight. Claustrophobia can be very damaging to a passenger’s mind, during a long flight. A virtual window using fibre optics and artificial imagery can never replace what a human eye can perceive. All electronic equipment can fail sometime or other. These will come under non-essential equipment and a flight will never be cancelled because the virtual imagery system failed. The mental outlook of a passenger who may suffer from claustrophobia should never be overlooked for costs. The adverse psychological impact in flying long hours in a windowless tube can be extremely damaging. One of the most important features of windows is safety in the event of a crash landing. A post-crash fire can be external, internal or both. In the event of an internal fire, the Rescue and Firefighting team that arrives should know exactly which part of the aircraft they can penetrate to enter the cabin. Similarly, for an external fire, both cabin crew and passengers should know which side of the aircraft is safe for evacuation. When there is a crash landing, or there is a power failure where all non-essential systems will be shut down to conserve battery power for essential systems, the virtual windows will disappear. To save costs, you are removing one of the most essential safety features. Airliners are designed to have redundancy of all systems that are essential for safety. What back-ups are going to be provided for the virtual imaging of windows? What will be the weight saving when you remove the double-walled glass panes and replace it with metal? There have been instances where engine fire or flight control damage has been noticed by a passenger looking out of the window and alerting the crew. This additional back-up feature will be lost for good. Coming to the economics and cost saving, the new airline concept appears to be in reverse order! Economics appear to take top priority. Safety and passenger comfort are secondary. First and Business class passengers may have space to compensate for the claustrophobia. Economy class passengers will be the ones to suffer. Seat pitches are being reduced, toilet size reduced to accommodate more rows of seats. Airlines are supposed to be part of a hospitality industry, but they are slowly diverting to profit accumulation without providing passenger comfort. They are taking advantage of people who have a compulsion to travel in spite of lack of comfort. Airlines work on the principle of Murphy’s Law: ‘If there is a possibility of several things going wrong, the one that will cause the most dam age will be the first one to go wrong’. The recent spurt in engine failures is something one has to note. An uncontained engine failure/disintegration is something that can never be ruled out. In the aircraft with double walled glass windows, the damage may occur only to the outer pane and it will not affect the pressurisation. However, in the windowless aircraft, all that the metal pieces would need to do is to pierce just a single metal sheet. The decompression effect may be more pronounced when the fuselage skin rips off. A saving grace for passengers is that a large majority of the airliners that fly will have windows and they will be able to experience the normal flight. Like we have seat preferences, a day may come when passengers will start travelling on aircraft of their choice. The cost benefits of a windowless aircraft will be nullified when passengers move away. Like the Concorde which became a white elephant due to poor order numbers, a windowless airliner may find very few takers. Excerpts from a concept paper presented at the 5th Challenges in European Aerospace Conference in the Netherlands. The concept removes the windows (even in the cockpit in future) or reduces them to partial views of the outside world by means of a display formed by back projection, lasers, holograms, or imaging systems fed by cameras outside the fuselage. The main challenge is to provide passengers with the same comforting aspect of a traditional window and avoid claustrophobia feeling. A promising solution is to recreate a condition similar to the one provided by fuselage windows, by the introduction of artificial views trough high fidelity displays. * Fuselage structure is lighter, fuel consumption lower and the impact on environment is minor. * Manufacturing modes are simpler so that the related costs are lower. 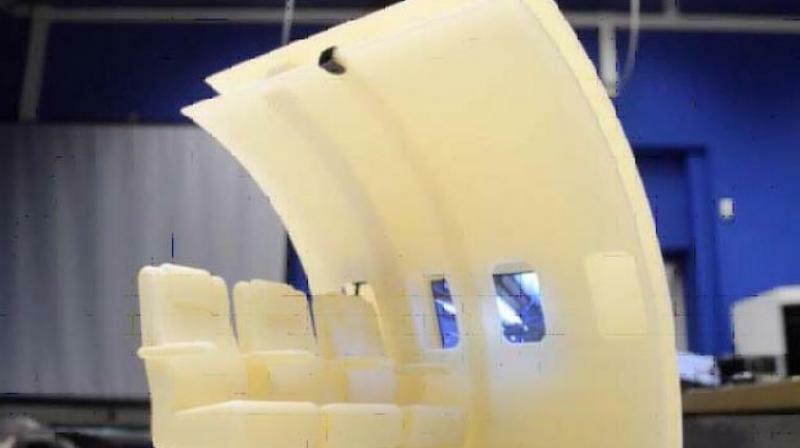 * Fuselage structure is more resistant to fatigue damage. * Possibility to take pictures of the outside world from the camera video and download them on personal smartphone. * Possibility to receive geographical information about the places flying-by. * Crew can get live images in case of an engine failure which they can evaluate and monitor. * The crew can also use the screens in order to communicate in a better way with the passengers.